It's time. Finally. 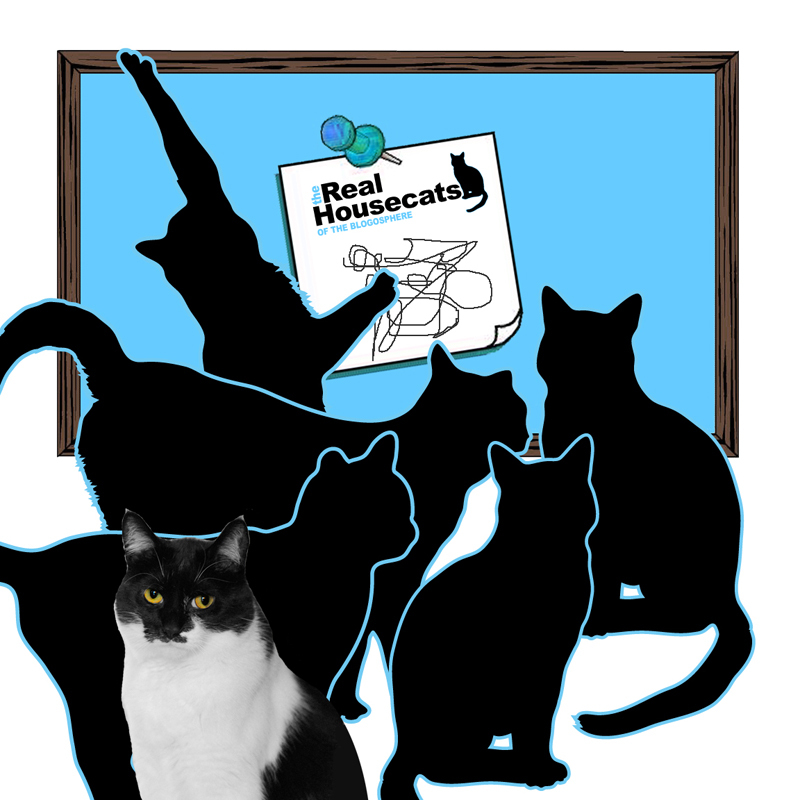 The big announcement of the Cast & Crew for The Real Housecats Of The Blogosphere is here. So where's the list? What...you were expecting a bulletin board with a piece of paper pinned to it? Cats crowding around like high school drama students? Well surely you know that Glogirly and I have standards. An announcement this big warrants a BIG reveal. Click HERE to view the official preview on YouTube. Or just click below. This is just the preview...the REAL deal will launch in a few days. I want to thank everyone who submitted their photos and bios. We received over 200 photos! Glogirly says that with this project she's officially reached Crazy-Cat-Lady status. Not because of the whole video-making thing, but because she feels like she knows you so well, loves you and is the proud owner of 20 cats. We wish we could make EVERY cat an official cast member. But every good cast needs an awesome crew! And every cat that didn't land a starring role is part of the Official Real Housecat Crew. We've got something special in store for you too! To me and Glogirly...You are ALL Real Housecats! Wow, how awesome! I will have to give Binga a whap for not sending in her info and photos (or maybe I should slap my human who is in charge of the actual sending) because I notice there is no tortie in the cast! And a good soap opera could always use a tortie! Although I get the feeling that CK will add quite a bit of spice all on her own. It looks like a lot of fun! We can't wait to see the end product. You do a great job! Since my brother is a going to be a "Real Housecat" does that mean I have to be nice to him? I am so excited I am thinking about peeing on a houseplant! Whoohoo! We are so excited to be part of this! Ernie wants to know how much work he has to do as part of the crew. I told him he's gonna hafta take care of the cast...like get us our nip and make sure we have enough treats and stuff. I'm gonna run him ragged! SCREE! I'm a Real Housecat!! *runs back and forth through the Tunnel of Pain* Maybe I'd better wait until tomorrow to comment when I've calmed down!! Pack my bags, this little ghetto cat is going to Hollywood! Uh oh...just realized that Ginger is a part of the crew...and he is uh....no nice way to put this. He's lazy!!!!! Could mean trouble...or dare I say it...drama!!!!!?? This is sooooo exciting!!! We can hardly wait! Awww at first I was super bummed that I didn't make it into the cast but I am proud to be among such great kitties that are part of the crew! Wow, what a great cast! Can't wait to see more!! Oh it looks fabulous, can't wait! How exciting to see many of our friends in the Cast and Crew, and also a lot of new kitties we don't know yet. Ernie, those extra toes will come in handy as a crew member! Does this mean I can demand my mom to give me steaks every day ?? Good luck with the project, it looks like it's going to be a good 'un. This is so exciting. We can't keep still! That is so cool! We can't wait for the first episode! What a great trailer! We can't wait for the show. We're so excited about the project! Can't wait to see what happens next! WQoohoo - this is so exciting - I can't wait to see the movie. Thanks for the opportunity Katie. Oh, I am so thrilled I made the cast. I can't believe it. We were so happy to see me on the screen. And didn't I look pawsome in shades? But then I think we all looked great, I am so looking forward to working with everyone. Oh I just thought I would mention Tsarina is a title like Empress, my name is Artemisia. I don't know if anyone will recognize my title as I hardly ever use it. When I first came to live here Scylla was already Queen and since I am the alpha Mommy had to find a title that outranked hers. Me and Charlie love love love the trailer!! Oh wow!! Yay for Real Housecats!!! Awww well done cast and crew!! This is gonna be the best show EVER! I just know it. Oh! Oh! Oh! Me was so excited last night that me went right to the video and sended it to all my family and forgotted to tell yous how excited me is to be part of such a exceptional cat and crew! Thanks yous! for picking me! Oh my Cod! Katie, you're brilliant!! Well OK, we'll give Glogirly some credit, too 'cause we know she helped at lot. We can't wait to see this awesome show. I think eveyone is gonna have fun! We just read your "About Us" page - and mommy went, "WOW!" Our Momma's dad worked at NASA-MSC too! Did yours come from ABMA in Huntsville, AL, too? Mowzers, it's a small world! Oh boy! We are SO excited to watch the show! How exciting! The cast is comprised of some very interesting characters! We are really looking forward to seeing the show. Dear GG, I think you've lost it in the most fun way! Can't wait.